"Have you ever in your life attended any Church meeting-priesthood meeting, sacrament meeting, Relief Society, Sunday School, a conference or fireside, a seminary class, a temple session, or any other meeting sponsored by the Church-where any encouragement or authorization was given to be dishonest, to cheat in business, or take advantage of anyone?" "Have you read, or do you know of anything in the literature of the Church, in the scriptures themselves, in lesson manuals, in Church magazines or books, in Church publications of any kind, which contains any consent to lie, or to steal, to misrepresent, to defraud, to be immoral or vulgar, to profane, to be brutal, or to abuse any living soul?" "Have you ever been encouraged in a training session, a leadership meeting, or an interview to transgress or misbehave in any way? Have you ever been encouraged to be extreme or unreasonable or intemperate?" "You are inside the Church where you can see at close hand the conduct of bishops or Relief Society presidents, of high councilors, stake presidents, or General Authorities. Could such conduct be described as being typical of them?" "You are active and have held positions in the Church. Surely you would have noticed if the Church promoted any of these things in any way." "Why then," I asked him, "when you hear reports of this kind, should you feel that the Church is to blame?" "Have you not been taught all of your life that if a member of the Church, particularly one in a high position, is unworthy in any way, he acts against the standards of the Church? He is not in harmony with the teachings, the doctrines, or with the leadership of the Church. "Why, then, should your faith be shaken by this account, or that, of some alleged misconduct-most of them misrepresented or untrue?" There are those who assume that if someone is depressed, the Church must have caused it. If them is a divorce, somehow the Church is to blame. And on and on. Really, that is something of a backhanded compliment. It is an acknowledgment that members of the Church are supposed to know better, and we're supposed to do better; and when we don't, they point at the Church. Are they really being fair? Could it be that they point to alleged misconduct, insinuating that the Church is responsible, to excuse themselves from living the high standards of the Church or to cover some failure to do so? You think about that-carefully. "Here is a congregation. You are to preside over them. They are under constant temptation, and you are to see that they win that battle. Govern them in such a way that they can succeed. Devote yourself unselfishly to this cause. "And, incidentally, while you preside, you are not excused from your own trials and temptations. They will, in fact, be increased because you are a leader. Win your own battle as best you can." When you hear stories, be wise. Unless you are in all the interviews, and hear all the evidence, you are not in a position to really know. Be careful, lest you jump to a conclusion. Unless you are a participant and have full knowledge, better: "Judge not, that ye be not judged. Now, then, stand steady. Keep your faith. I bear witness that the gospel of Jesus Christ is true. God lives and directs this work. The Church is on the right course. It is on schedule. And I bear witness that it is righteously led by a prophet of God. It is our responsibility to teach the subject in such a way that the principles of truth will overcome the misconceptions and misleading falsehoods that are taught so widely. We must teach so powerfully and so permanently that the truth cannot be overcome by the temptation to immorality, no matter how enticing. In 1958 seminary and institute teachers were assembled at Brigham Young University for a summer school. I was assigned by President William E. Berrett to talk on the subject "Problems in Teaching the Moral Standard." In preparation for that assignment, I made a more than usual investment in prayer and fasting, in research and inquiry, including interviews with some of the General Authorities. In the process of that preparation I came to some conclusions that I have not since that time abandoned—indeed, they have become reinforced through all that I have since learned on the subject. I am convinced that two of the major mistakes are to teach too much about the subject and to teach it at the wrong time. I am firmly convinced of the following principles. The notion that our young people need to be taught in great detail all of the facts relating to the physical processes involved in reproduction at an early age is nonsense. The overteaching of it is not a protection. Such things as they should know about the subject should be taught in a framework of reverence and modesty. The responsibility and the right to teach these sacred processes rest with the parents in the home. I do not believe that it is the responsibility of the public schools, nor is it the responsibility of the organizations of the Church. The contribution of the Church in this respect is to teach parents the standards of morality that the Lord has revealed and to assist them in their responsibility of teaching these sacred subjects to their children. Because many parents do not accept this responsibility, some consideration of it is given by the Church. When this is justified, if it is justified, the subject ought always to be treated in the framework of reverence. In treating this subject, I do not personally see the necessity of using clinical terminology. I do not see the necessity of using explicit names of the organs of the body, nor for those processes by which bodies are conceived as a tabernacle for the spirit. The one place in the Church where some frank discussions may be appropriate is during an interview for priesthood advancement, for a call to a position, for a temple recommend, or in an interview in which a member is confessing transgression in order to get it resolved. Occasionally, deep inquiry may be necessary. This teaching process, and that's what interviewing can be, ought likewise to be shrouded in modesty and the subject ought to be treated with reverence, wisdom, and restraint. I know of more than one instance in which a young person has been led to experiment in gross and perverted immorality because of a suggestion that originated with his bishop in an interview. Those who teach, and I refer to leaders, to teachers, and to parents, should keep in mind this message. Picture a father and mother leaving home for a period of time. Just as they go out the door they say to their little children who are to be left untended during their absence, "Now children, be good. Whatever you do while we are gone, do not take the footstool into the pantry, and do not climb to the fourth shelf and move the cracker box and reach back and get the sack of beans and take a bean and put it up your nose, will you?" Some of us are just that foolish. The humor of the illustration is wry humor when you think of the first thing that happens after the parents are gone. Surely we can be wiser than that. Young people should know from the very beginning that chastity is a sacred subject. At the summer school mentioned, I put together some thoughts on how I would like my children to be taught this subject by others outside our home. 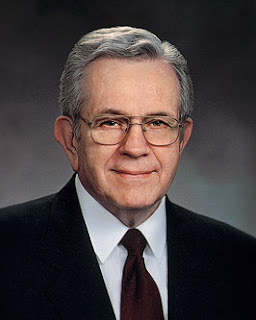 Then over a period of nearly fifteen years, I worked on this subject until I was confident enough to deliver it as a sermon in general conference under the title "Why Stay Morally Clean." You may not immediately be aware as you read it that you will not find a certain three-letter word that is usually included in the title of this kind of education. The favorable response from young people has been considerable, and I am continually grateful. Their responses frequently express gratitude for the declaration that the power of creation is sacred and that it is good. They seem to appreciate a positive indication of when and how and for what purpose that power is to be employed by them in mortality. To me assuring evidence favoring such an approach has been the aforementioned response from young people literally all over the world, since "Why Stay Morally Clean" has been translated into many languages. If you are a teacher and if you are a parent, I would urge that you approach the teaching of this subject with reverence, with humility, and with modesty and moderation. May the Lord bless you as you do so. I am sure that within the sound of my voice there is more than one young person who already has fallen into transgression. Some of you young people, I am sure, almost innocent of any intent but persuaded by the enticements and the temptations, already have misused this power. Know then, my young friends, that there is a great cleansing power. And know that you can be clean. If you are outside the Church, the covenant of baptism itself represents, among other things, a washing and a cleansing. For those of you inside the Church there is a way, not entirely painless but certainly possible. You can stand clean and spotless before Him. Guilt will be gone and you can be at peace. Go to your bishop. He holds the key to this cleansing power. Then one day you can know the full and righteous expression of these powers and the attendant happiness and joy in righteous family life. In due time, within the bonds of the marriage covenant, you can yield yourselves to those sacred expressions of love which have as their fulfillment the generation of life itself. Someday you will hold a little boy or a little girl in your arms and know that two of you have acted in partnership with our Heavenly Father in the creation of life. Because the youngster belongs to you, you may then come to love someone more than you love yourself.